I’ve owned this CNC mill for several years. In that time, I’ve rebuilt it twice and added limit switches (crudely using hot melt glue!). There is something I have never done with it though, and that’s to actually use it. In fact, I’ve never cleanly finished configuring it. 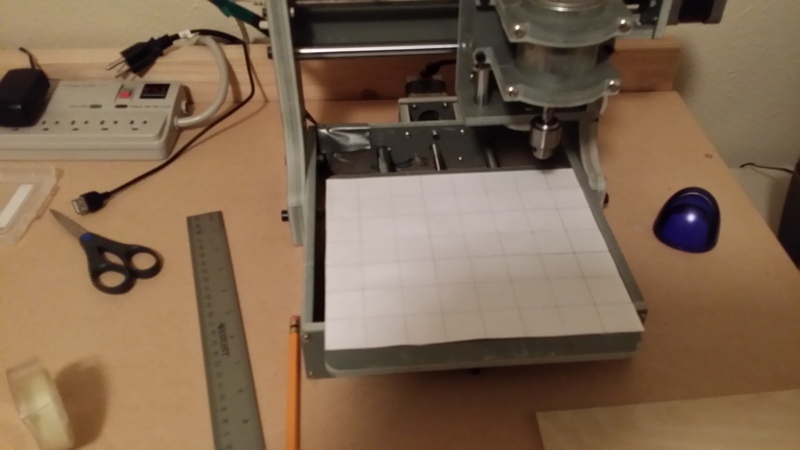 As I set out on my mission to cut an aprs tracking PCB, and carve out the shell of a model hovercraft (yes, these are my two current projects), it’s time to finally configure this mill correctly so that I can begin to make use of it. My Mach3 software is aware of all three axis motors, and the main spindle, and operates them correctly (almost), and it’s also aware of the limit switches, which function. The first of the problems that I need to resolve is one of calibration. 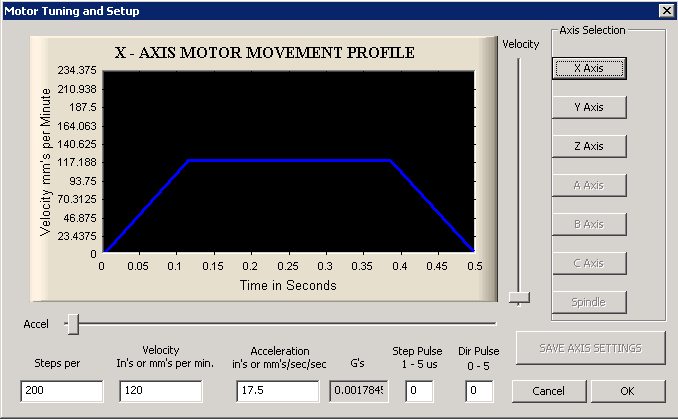 My Mach3 software has no idea how wide the table is, or how many steps are required per revolution of the motors. To resolve this problem we need to know a few things about the motors, and the board which controls them. The board is the easiest part to know, because I bought it myself to replace the one that came with the mill (a capacitor on the original board exploded the first time I plugged it in). 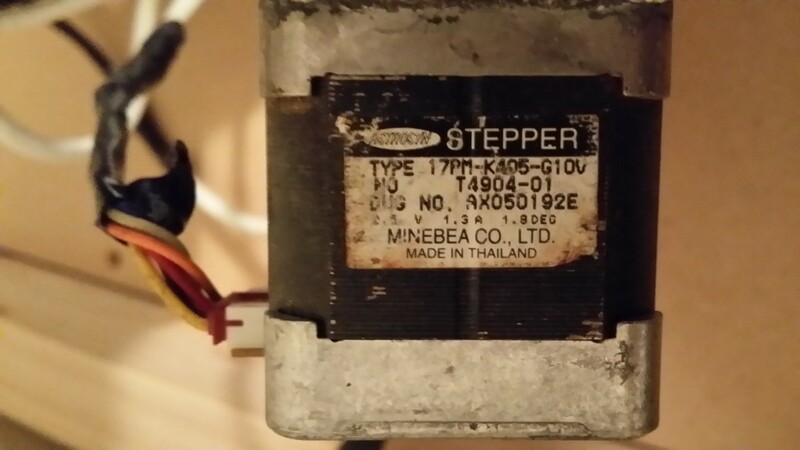 The board is a Toshiba TB6560 3-Axis driver board, and it looks like this…. However, the motors (which came with the machine) are a little trickier. 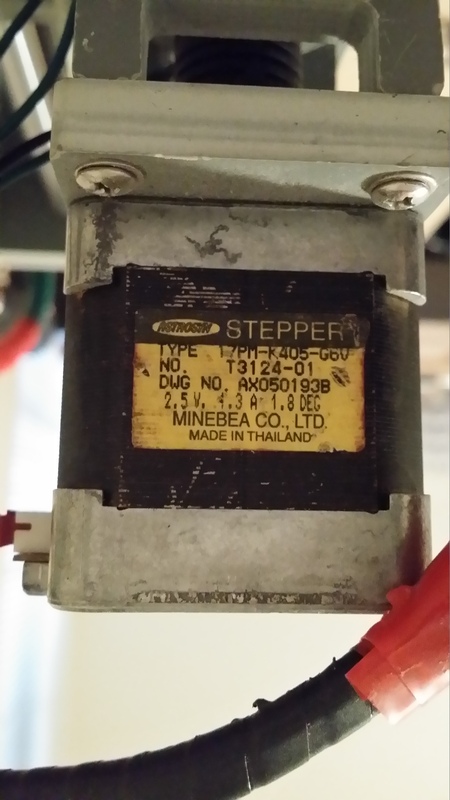 I can tell that they are all MINEBEA CO motors, and there are some model number markings, which appear to be different for each motor. What I need to know for each of them is the number of pulses required per revolution. So it’s time to use a popular search engine to find out more about these motors! According to this data sheet, all three of my motors, despite having slightly different type numbers, fall under the same series and therefore have the same values with regards to the specifications that I need. Temperature Rise………………………………………….. 80º C Max. Dielectric Strength…………………………….. 500 VAC for 1 min. This data tells me that a single step is 1.8 degrees, which means there are 200 steps in one revolution. 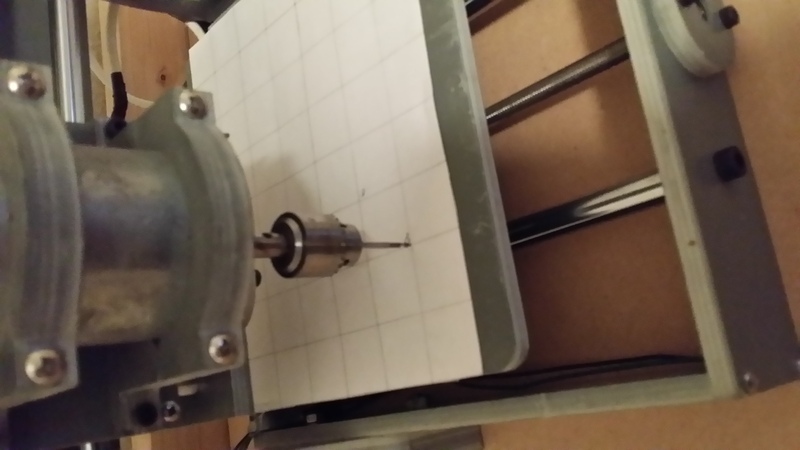 Mach3 isn’t happy with this data alone though, it doesn’t want the steps per revolution but the number of steps per millimeter (as my mill is setup to be metric, otherwise it would be per inch) of motion. To calculate that, I need to know the number of revolutions of the motor will drive the cutting too one millimeter. 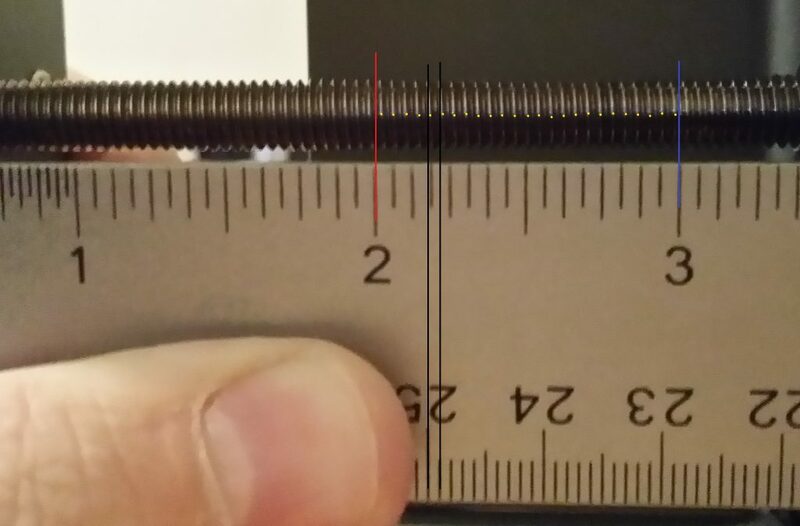 Using the count of 25 threads per inch, it looks as though I should set the mill to 196.85 steps per mm, which is terribly close to my first estimate that each thread is 1mm (in which case that would be 200 steps per mm). So I’m going to start from the assumption that each revolution of each motor equates to 1mm of travel. 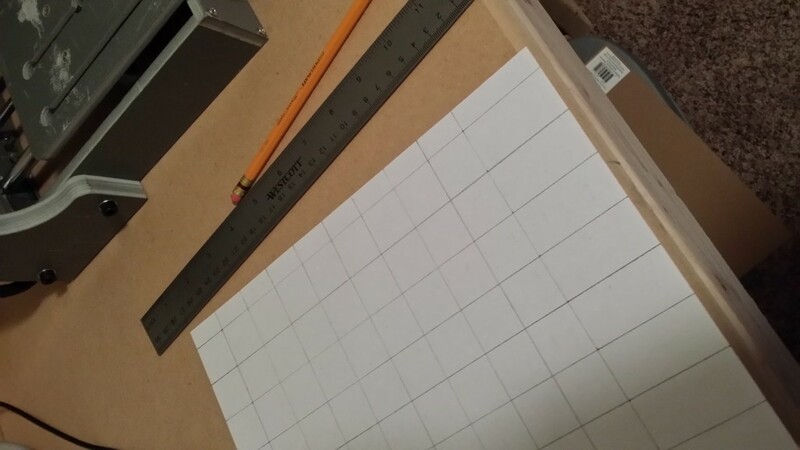 So now, if my revolutions per inch and steps per revolution calculations are correct, I should be able to accurately move the head 1 inch, and confirm it by the distance moved across the paper. 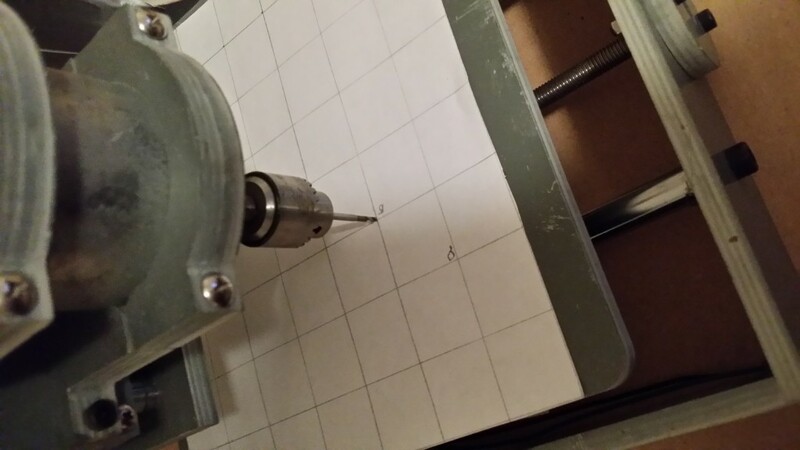 I jog my drill bit over to the corner of one of the 1-inch squares on the table. Then I set the job co-ordinates on my screen to 0,0,0 and jog the drill bit to another corner of the inch. Oh no! Mach3 is reading X=40.0700, Y=41.0700! I was expecting them both to read around 25.4 (given that there are 25.4mm in an inch), so what has gone wrong?! *note: To be sure, I did perform the same test at 196.85 steps per mm as were the numbers from my calculations in inches, not because I questioned the math, but because it was a quick double check of my assumption from earlier. Now, I have been through this process before. There’s a process by which you can calibrate your mill by moving the bit a specified distance, and allowing Mach3 to count the number of steps (pulses) it took. Before I started trying to calibrate by mill this evening, it was set at 300 steps per mm. With some experimentation, I’ve found that setting the software up at 325 steps per mm, I get really close to precise numbers. Trying both the X and Y axis in a single measure, I get 24.5mm for the X-axis, and 24.9mm for the Y axis. This puts me a fraction of a mm off measure in either axis, but given that I’m measuring by eye with pencil lines, that’s not all too bad. So I’m now stuck with something of a puzzle as to where I went wrong. Perhaps someone reading this will recognize it and let me know!